Russian government blaming Islamists for Boris Nemtsov's Murder. 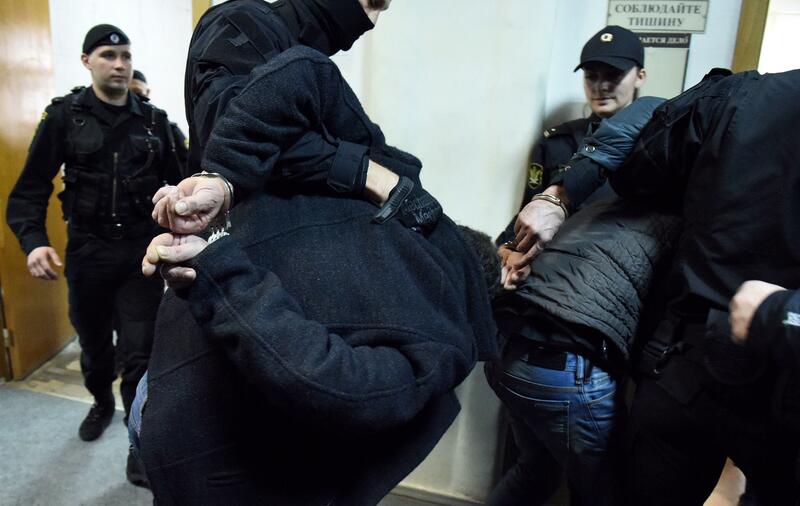 Unidentified suspects detained over the killing of Russian opposition activist Boris Nemtsov are escorted by policemen in a court corridor in Moscow on March 8, 2015. After the killing of Russian opposition leader Boris Nemtsov, the Kremlin and its media allies have road-tested a number of possible theories for who pulled the trigger. Perhaps it was a jealous ex-girlfriend, right-wing Ukrainian militias, fellow opposition leaders, the CIA, or even Hillary Clinton? But authorities seem now to have settled on one story: radical Islamists, they say, murdered Nemtsov. Five suspects, all Chechen, were marched into court in Moscow on Sunday. Two of the men, including a former senior policeman, were formally charged, and the other three are being held as suspects. A sixth suspect reportedly blew himself up during a standoff with police in the Chechen capital, Grozny, over the weekend. Why did these men allegedly want to kill Nemtsov? Chechnya’s Kremlin-backed strongman leader, Ramzan Kadyrov, wrote on his Instagram account—his preferred medium for public pronouncements—that he knew the former police officer, Zaur Dadayev, as a “patriot” and a deeply religious man who “like all Muslims, was shocked by the actions of Charlie and comments in support of printing the cartoons.” The Charlie Hebdo theory—this idea that radical Islamists killed Nemtsov because he spoke out in support of the French satirical newspaper—had also been suggested in a statement by the Russian Prosecutor General’s Office in the wake of the killing. This seems like an unlikely motive. It’s true that Nemtsov condemned the Paris attack, as did figures from across the Russian political spectrum, including President Vladimir Putin. Foreign Minister Sergei Lavrov participated in the solidarity march held in Paris in January. In a blog post following the attacks, Nemtsov compared contemporary Islam, a “young religion,” to Christianity at the time of the Inquisition. He wrote that Islam would eventually “grow up,” leaving terrorism in the past, but in the meantime, terrorism should be condemned and the secular state defended. By the standards of rhetoric about Islam in Russia—or in the United States, for that matter—it’s pretty mild stuff. Nemtsov was not primarily known for his views on religion, and Islamist radicals in Russia have tended to direct their efforts against the government—which waged two brutal wars in Chechnya—rather than on the government’s liberal opponents. Nemtsov’s allies have been quick to dismiss the Islamist motive as nonsense. It “suits the Kremlin and takes Putin out of the firing line,” said Ilya Yashin, one of the co-leaders of Nemtsov’s political party. Yashin said on Twitter that he expects that “the trigger man will be blamed, while those who actually ordered Nemtsov’s killing will go free.” The Russian opposition has maintained that Nemtsov was probably killed as a result of his opposition to Putin’s government, either by agents of the state or independent nationalists riled up by state propaganda. For veterans of the opposition who followed the aftermath of investigative journalist Anna Politkovskaya’s 2006 murder, a sense of déjà vu is likely setting in. In that case too, several Chechens and a former police officer were eventually convicted of the murder, but the person who ordered the killing has never been identified.